Unite the Right: White supremacists rally in Charlottesville, Virginia comes a day after far-right activists carried torches and clashed with university students. 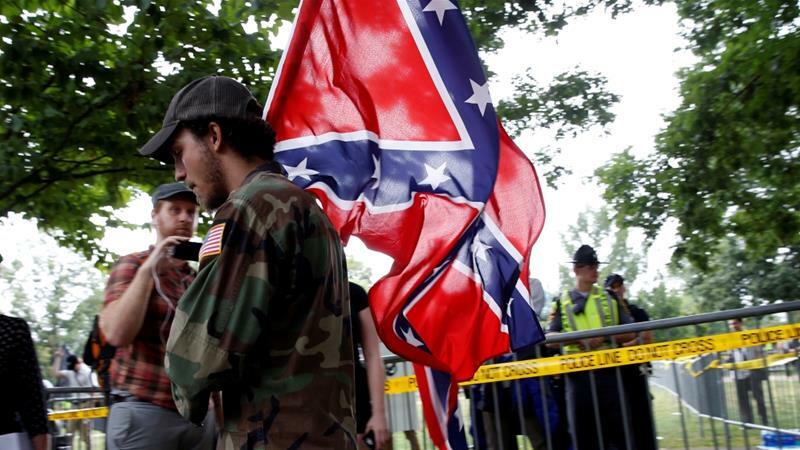 Hundreds of far-right activists have gathered in the US city of Charlottesville, Virginia, to rally against plans to remove a Confederate statue, prompting the city to declare a “local emergency” amid clashes. Announced on Saturday morning, the declaration of a local emergency has enabled local authorities to obtain additional resources and render the rally an “unlawful public assembly”. Writing on Twitter, Virginia Governor Terry McAuliffe also announced a state of emergency to “aid response to violence at the alt-right rally in Charlottesville”. Organised by Jason Kessler, a former journalist and member of the Proud Boys, an ultra-nationalist group, Saturday’s “Unite the Right” rally was slated to be one of the largest white supremacist events in recent US history. It is the third event of its type to be held in Charlottesville, a university town of 46,000 people, throughout the last four months. Earlier this year, the city voted to remove a statue of Robert E Lee, the foremost military Confederate military leader during the US Civil War, prompting similar far-right protests in May and July. Among those in attendance are well-known figures such as Mike Peinovich, a white supremacist podcaster who also goes by Mike Enoch, and Richard Spencer, a leading figure in the alt-right, a loosely knit group that includes white supremacists and neo-Nazis. The groups who sent members included the National Socialist Movement, the Traditionalist Worker Party and Identity Evropa, among other white supremacist and far-right movements. Emily Gorcenski, a Charlottesville-based activist, said that far-rightist activists made “threats, many promises of violence and incitement to violence” ahead of Unite the Right. “What we’re seeing is that they have no qualms about allying itself with violent and hateful groups like the National Socialist Movement, the KKK and other [similar] organisations,” she told Al Jazeera. Led by local church groups, community organisers and Black Lives Matter, several counter-demonstrations have started in different locations across the city. Although city officials attempted to move Unite the Right from Emancipation Park, the site of the Robert E Lee statue, to another nearby park, a federal judge reinstated the group’s permit for the original venue on Friday. The Virginia State Police announced on Twitter that arrests had been made, but it did not specify how many people had been detained. 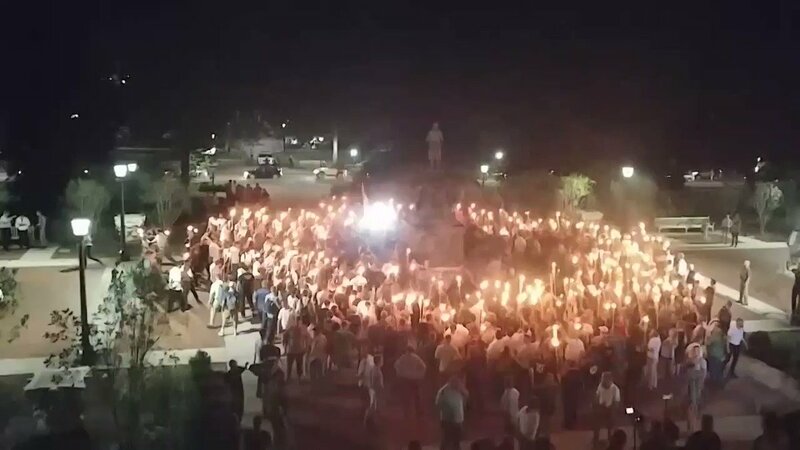 On Friday night, hundreds of marchers descended on the University of Virginia carrying torches and yelling slogans “white lives matter” and “blood and soil”. According to anti-racist and anti-fascist activists who were present, the far-right activists encircled and attacked a group of students who were holding a counter-protest. Michael Payne, co-chair of the local Democratic Socialists of America chapter, described Unite the Right as an “effort to intimidate the community”. “Last night, the alt-right protesters initiated the violence … The neo-Nazis surrounded them with lit torches and started macing and beating the students,” he told Al Jazeera, explaining that police arrived after clashes started. Videos and photos posted on social media also showed the far-rightists surrounding and confronting counter-demonstrators. Police eventually intervened after clashes broke out and dispersed the crowd. Payne said that local community organisations, church groups and the Black Lives Matter civil rights movement “have led the charge” in staging counter-demonstrations throughout the city. After Friday night’s march, Kessler took to Twitter to celebrate the large turnout, describing it as a “incredible moment for white people”. Far-right groups supported right-wing President Donald Trump’s campaign and celebrated his electoral victory last November, seeing common cause in his efforts to limit immigration and repeal affirmative action, among other policies. Alexander Reid Ross, author of Against the Fascist Creep, explains that the Unite the Right rally was part of an effort to “shape the [far-right] movement as more serviceable populism”. “What we’re seeing is Richard Spencer really attempting to get away from the sort of bickering that the alt-right has been involved in,” he told Al Jazeera, referring to recent disputes between various factions on the far right and militia groups. Although the Oath Keepers and similar militia groups, most of which are pro-Trump, have publicly criticised the alt-right and groups like Identity Evropa for racism, they have showed up to several far-right protests to confront counter-demonstrators in recent months. “They still say that there is a division that separates them, and that they’re against fascism and racism, but it’s clear that fascists are using these rallies to organise,” Ross said. Richard Spencer and other Unite the Right participants lauded the large turnout for Unite the Right and Friday’s march at the University of Virginia. Unite the Right comes after months of increased clashes between far-right groups and anti-fascists. Kim Kelly, a journalist and member of the Metropolitan Anarchist Coordinating Council, travelled to Charlottesville to attend counter-demonstrations on Saturday. “We’re at a pivotal point in American history, and in ten or twenty years’ time, when our grandchildren ask us where we were when fascism came to America, some will say that they stayed home and waited for the next election,” she told Al Jazeera. Chanting “blood and soil” and “one people, one nation, end immigration,” the group rallied around a statue of Thomas Jefferson before they clashed with counterprotesters, CNN affiliate WWBT reported. Officials in Charlottesville in the US state of Virginia have declared a state of emergency ahead of a large march by white nationalists. The move allows local authorities to request additional resources if needed, the police department says.